As metadata is data about data, and metaphotography is photographs of people taking photographs then I'd have to assume that metablogging is blogging about being blogged. I just implemented a delicious tagging system on A Head Full of Wishes (which I'll write up in more detail tomorrow) and posted about it to the Galaxie 500 Mailing List and David Jennings blogged about it on his book related Net, Blogs & Rock'n'Roll blog. But none of the other players have the depth of data about Tugboat that Head Full of Wishes has. A community of fans can take shared focus and commitment for granted, and when you add smart technology, smart organisation and good leadership to the mix, the community is pretty much impossible to beat in its chosen field. 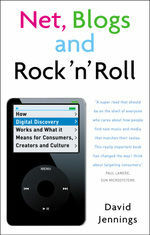 I suppose writing about someone writing about me could be questionable (and including a picture of me must only make it worse) but it does give me the chance to plug David's very excellent book Net, Blogs & Rock'n'Roll (buy from amazon uk | us) which examines discovering music in the digital age.